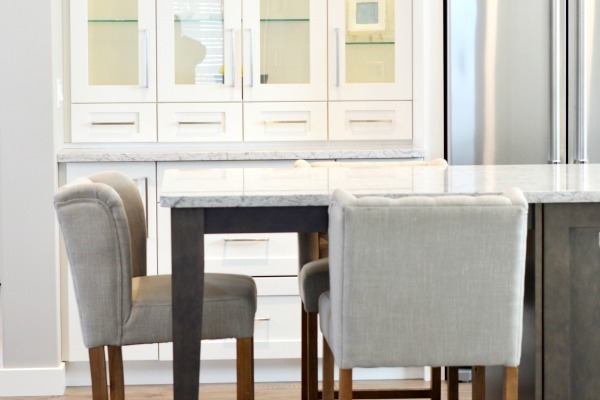 Clutter-free and sparkling clean counters in the kitchen are so inviting. It means you can jump right into whatever project you have in mind, easily begin cooking a meal or feel free to invite your neighbor in to share a cup of coffee. 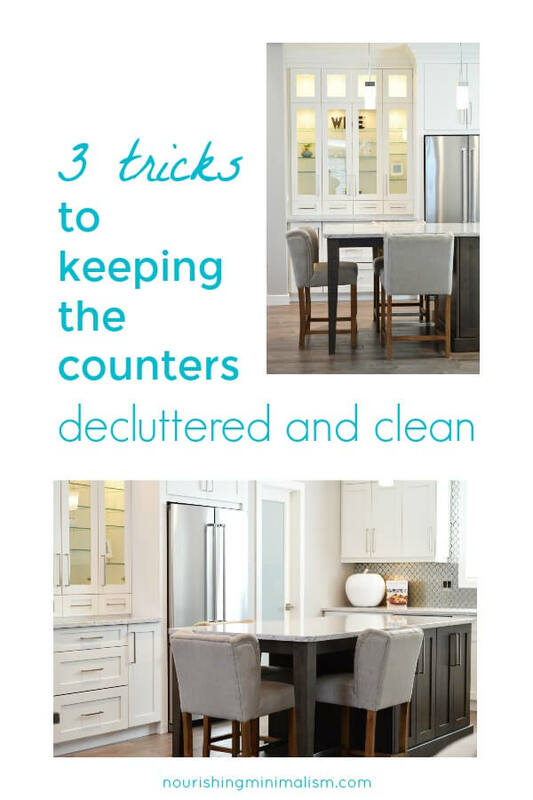 Keeping the counters clear isn't simply a once-and-done task, it's three-fold: changing habits, making space in the cupboards and developing a routine to maintain it. Change your daily habits of setting things on the counters. If you are cooking and open a package of pasta, dump the pasta in the water, then immediately throw the package away (or put it away if you didn't use it all). You only want to touch that package of pasta once. If you come home with mail in your hands, deal with it immediately- toss the junk mail, put the bills in your inbox, etc. You don't want to have to touch that junk mail again. When you bring your purse into the house, put it away immediately- not on the counter, not on a chair: you don't want to have to touch it again until you need your purse the next time. Keeping the one-touch rule in mind as you go through your day saves you time. It saves you from having to retrace your steps and pick up after yourself. In fact, one could call it a lazy person's rule. They are dealing with things immediately, so they don't have to think or do anything with that item again. Clear out the cupboards so you can store things in them. Most often we have things in the cupboard to store them, and we have things out on the counters because we use them regularly. Think very carefully about what you are storing and if it ever gets used. If you have an ice cream maker in the back of the cupboard, but you haven't made ice cream in 10 years, let it go and use the space in your cupboard for things that do get used. The toaster. Sure, you may use the toaster 3 or 4 days a week, but it's only for 5 minutes, why have it sit on the counter 24/7? Set it in the cupboard and make it easy for you to wipe the counters off. The KitchenAid mixer. It is pretty and made to sit on the counter, yes. But if you only use it twice a month, but you have to wipe it down twice a week from all the other cooking adventures... Store the mixer out of the way and cut down on how often you have to work around it. This applies to anything you have sitting on the counters. Appliances, canisters, utensils, etc. Think about how often you use them and if they truly justify taking up space on your countertop. Do they get dusty between uses? Are you consistently navigating around them as you clean your counters? Make your life easier and find other homes for things, so the counter is just a quick wipe-down and ta-dah! The kitchen is clean. Keeping your counters clear takes effort, you can't just remove all the appliances and then never worry about it again. The appliances were on the counter because it was a habit to keep them there. The first couple days after a change are nice, and you'll want to keep everything off those counters. But as the days wear on and the weeks pass, leaving the toaster out on the counter isn't going to seem like a big deal. Not putting the mixer back in the cupboard after you make cookies is going to come up. First, remember the one-touch rule. Put them away while you are right there, so you don't have to come back and do it later. It's very basic and should take 10 minutes or less on most days. The key is to do it after breakfast in the morning and after dinner at night. Being consistent means that nothing piles up and becomes overwhelming. The dishes stay manageable; the counters are never a disaster, you are in control. One touch rule is brilliant! Great point about frequent usage too. I already realized something that’s currently sitting out that could easily be put away. Thanks for the actionable tips! The kitchen counters are my challenge!!! I Don’t have a problem being organized anywhere else in the house, but my counters are ALWAYS cluttered. I seem to use everything that is in the cabinets and everything that sits on top. Ha!! If I am doing some kind of health regiment, it sits on the counter so I won’t forget it. I don’t have an issue putting mail or anything there, it is just the KITCHEN stuff itself. I seem to be hopeless. I did a big declutter of cupboards a while back and found a home inside for my cookbooks! But, yeah, those counters. The one-touch rule is also a struggle for me. But I can see where it’ll save me so much time and frustration. Thank you for sharing!